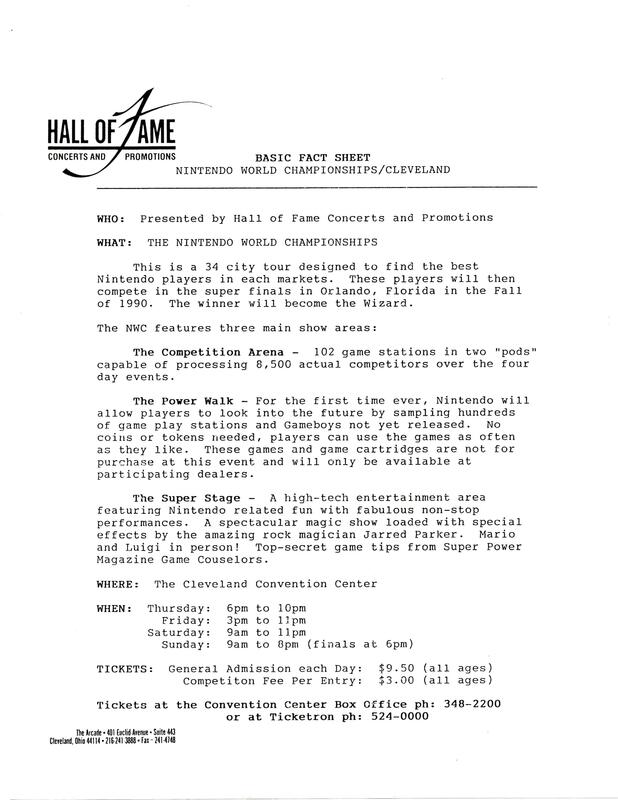 The Nintendo World Championships (“NWC”) 1990 cartridge is revered by many to be the holy grail of Nintendo items. 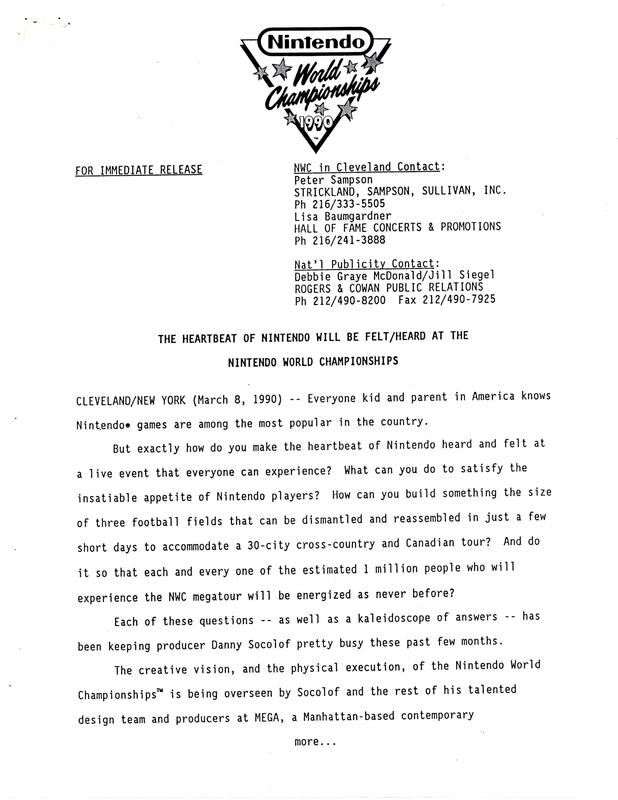 In 1990, Nintendo embarked on an epic road tip across the continental U.S. to find the greatest Nintendo Entertainment System player. 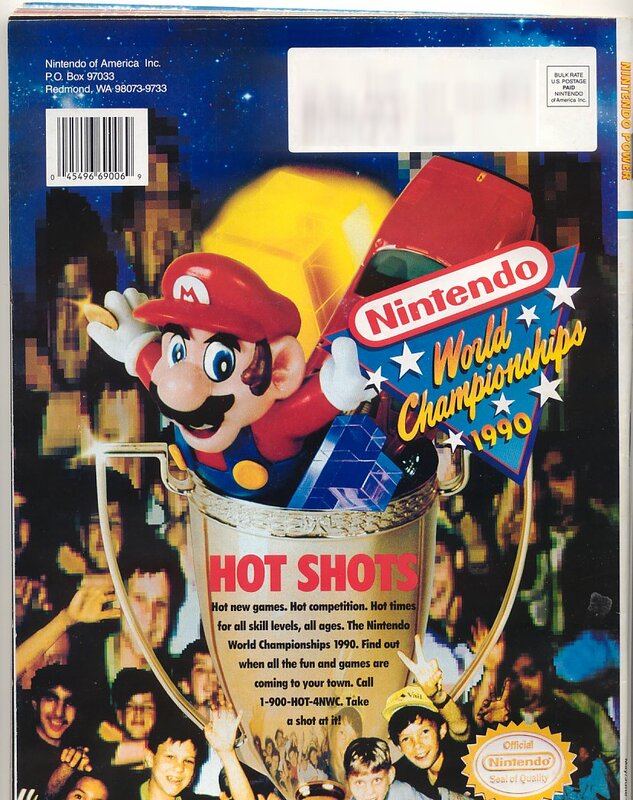 Similar video gaming challenges would later follow, but none have managed to match the amount of brouhaha and hype of the Nintendo World Championships. 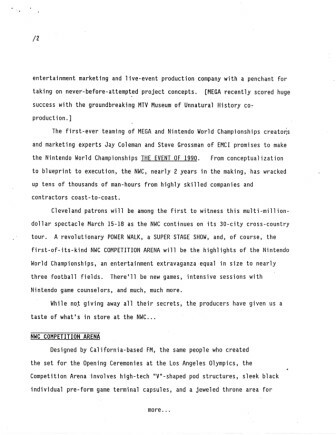 It was, in many ways, the video game competition to end all others. Prizes given to the contestants ranged from event t-shirts and baseball caps to even college scholarship money. 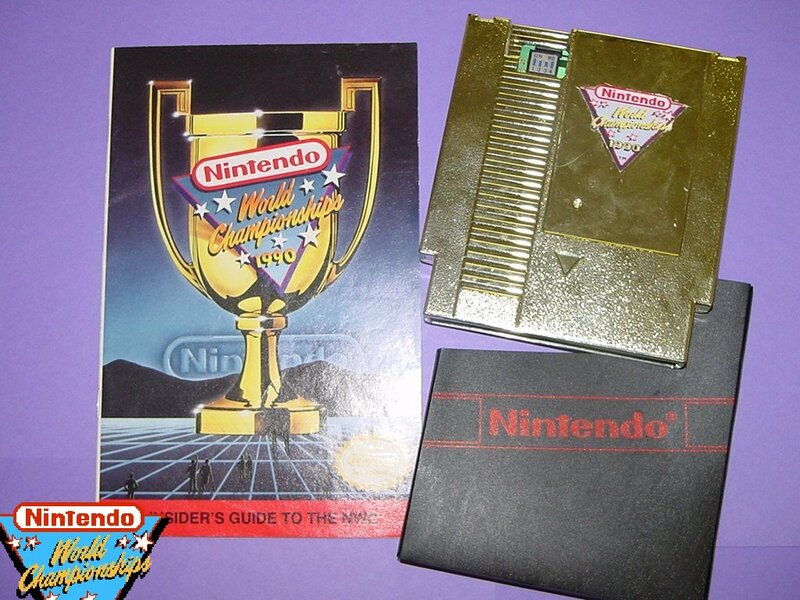 But the real tournament treasures come in the form of commemorative World Championships Nintendo Entertainment System cartridges. 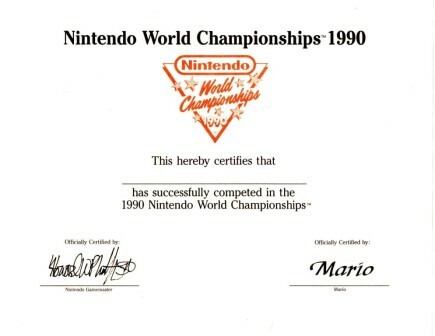 Championship finalists were awarded with one of 90 NWC cartridges. 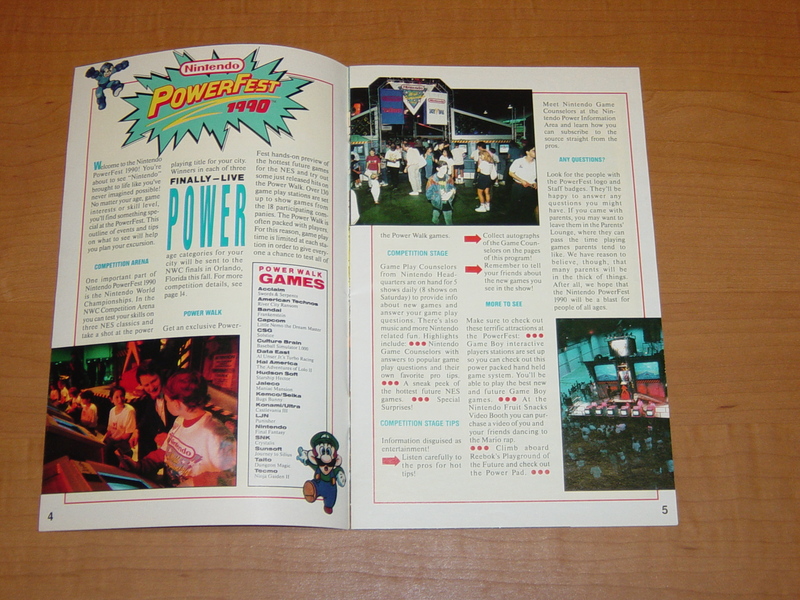 An additional 26 were mailed out from Nintendo Power in its magazine-sponsored contest. There are two variations of the cartridge, gray and gold, with the latter being far more sought after. 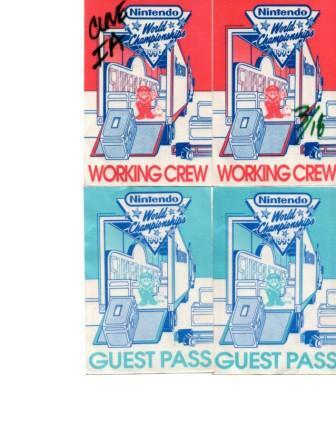 “The 90 gray carts given away to the contestants of the 1990 Nintendo World Championships were randomly selected from the overall pool of available Powerfest tournament carts of the actual touring competition. The other 26 gold carts were recycled and drawn from the same pool of carts. 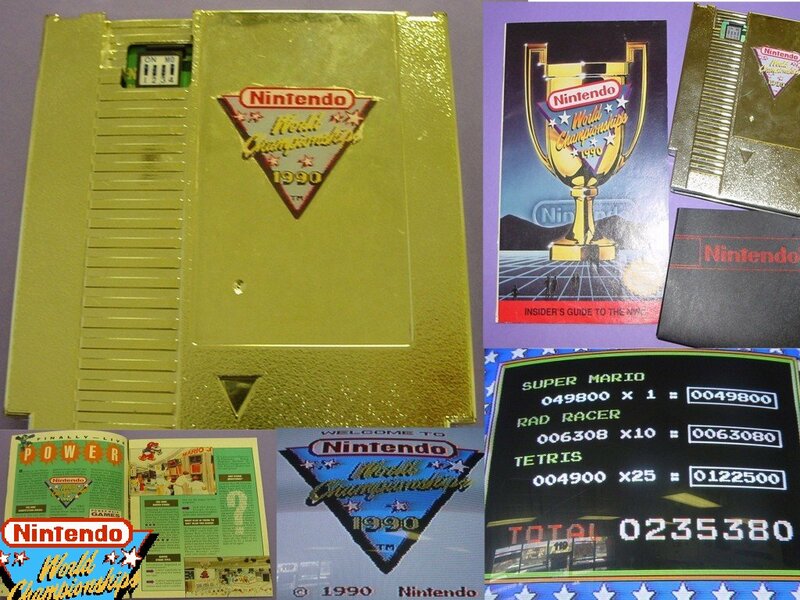 The gold carts were simply repackaged in Zelda-style cases with handmade 300dpi NWC logo stickers for the Nintendo Power Promo. 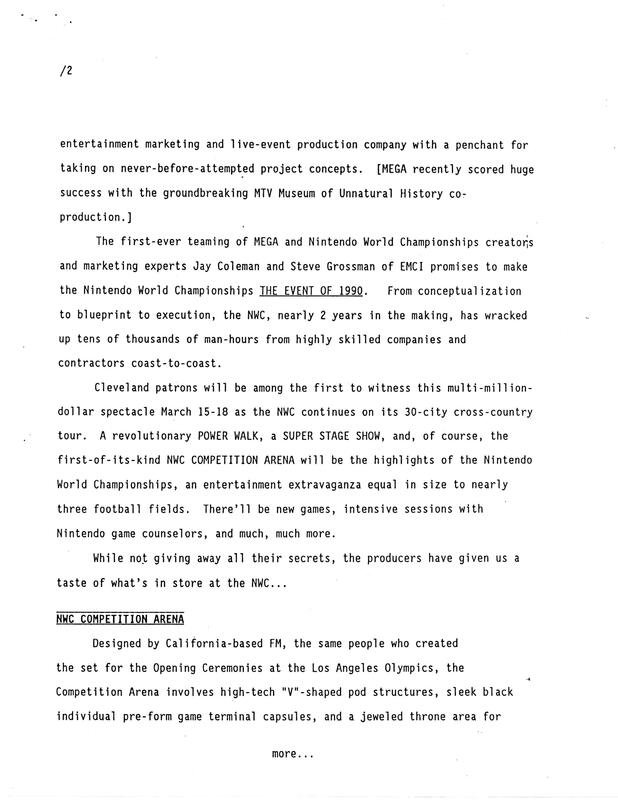 The original pool of competition carts numbered at 1,200 to accommodate the need for more tournament stations for larger cities such as Dallas, etc. 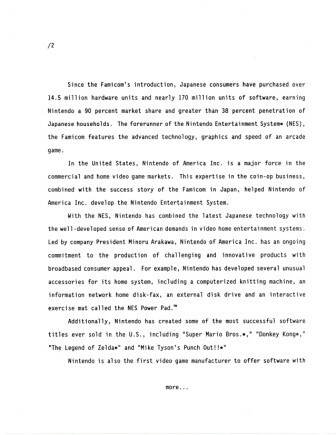 The remaining pool of carts was recycled/reprogrammed for use in the Campus Challenge after which most of (but not all) were stored or destroyed by Nintendo of America. So, in reflection, it is possible to see a cart numbered at 0076 and another at 227 or more, but there are only 90 gray carts and 26 gold carts total in public circulation. 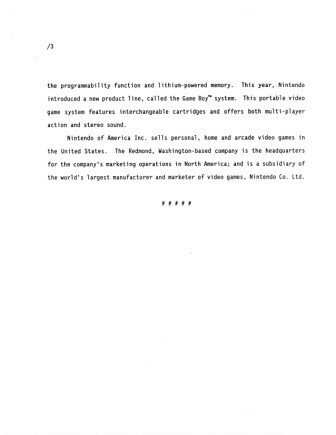 It is not impossible that some extra gray carts leaked from Nintendo before destruction by employees of Nintendo of America. This can be substantiated by the resurfacing of the Campus Challenge game-pak which was never meant to be circulated into the public through any promotion whatsoever. 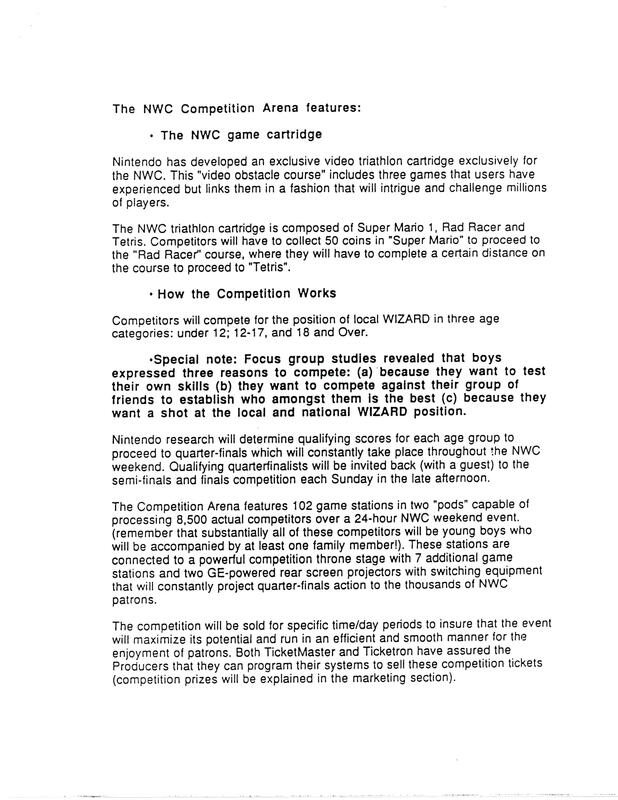 These cartridges contained the same three games that were used during the tournament: Super Mario Bros., Rad Racer, and Tetris. Recall, for a moment, the memorable scene in The Wizard when Jimmy Woods and the two other competing game players go head-to-head in the Video Armageddon showdown. 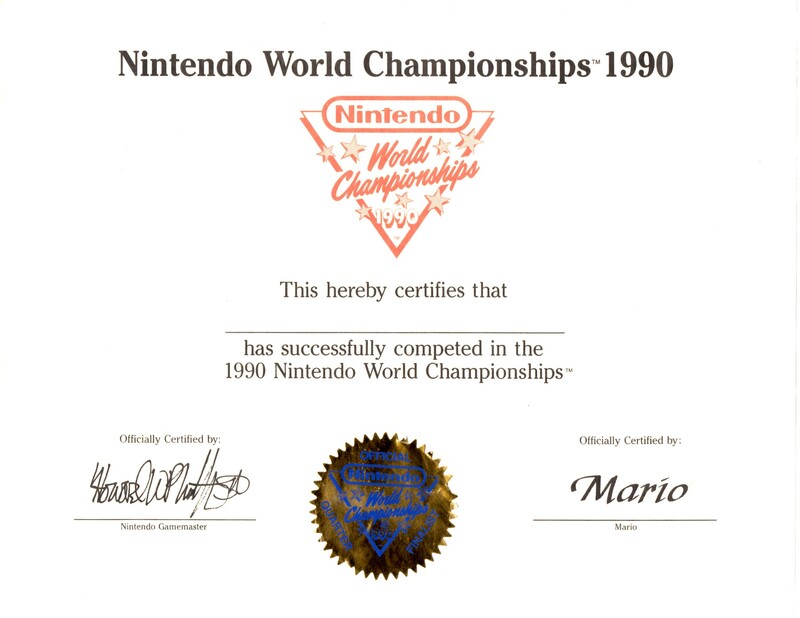 The Nintendo World Championships was a lot like this. 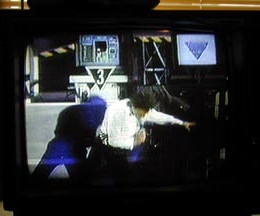 Players had to complete an objective in a game and then move on to the next one, all the while collecting as many points as possible within the six-minute time limit. 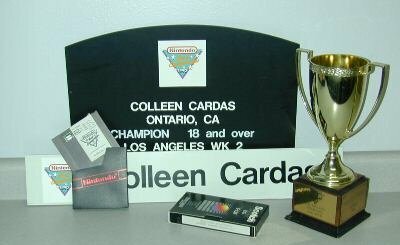 Colleen Cardas was among the contestants who competed in Los Angeles. Her husband placed second the first weekend, and she won first place in the 18 and up division the second weekend. 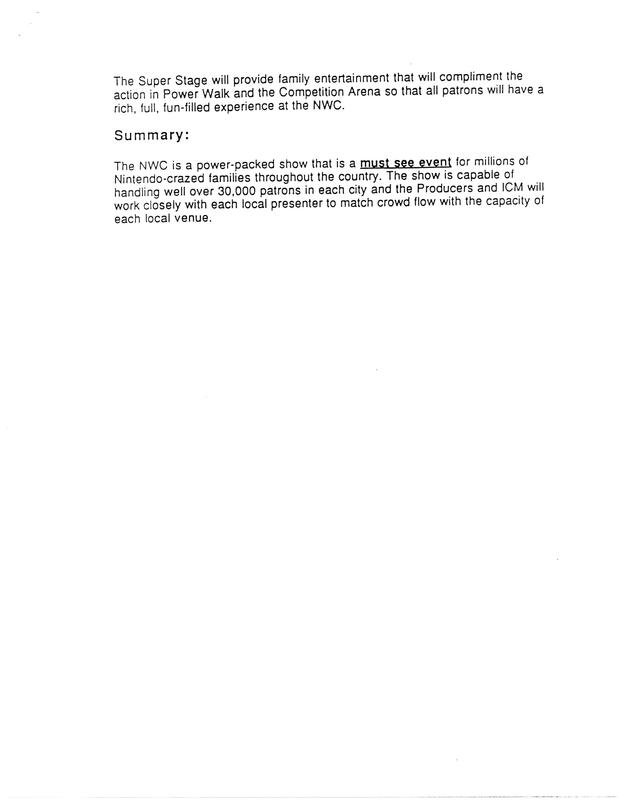 I contacted Colleen to inquire about a VHS tape that she had picked up from the event. According to her, the video is like an untelevised commercial of the final event. 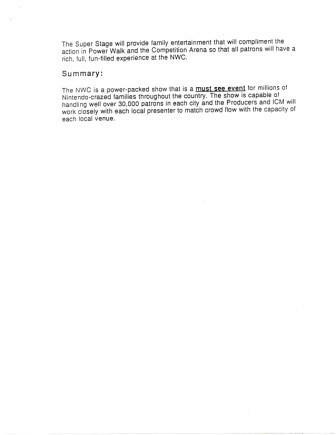 It is narrated by one of the stage commentators who wore fancy suits and yelled out scores as people were competing, all in an effort to increase the drama and excitement for the players and keep the audience involved. 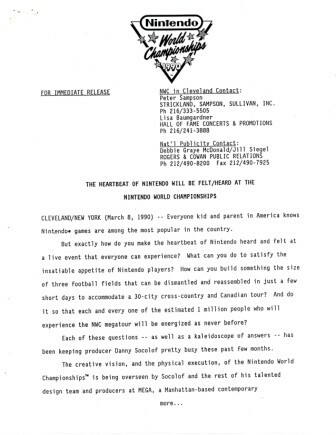 This same guy was on stage in Denver and Georgia, as Colleen’s husband traveled to both of those cities while trying to win one so he could also compete in the finals. The following photographs show Thor Aackerlund, the eventual champion of the NWC, battling it out with Rich Ambler in the final round. 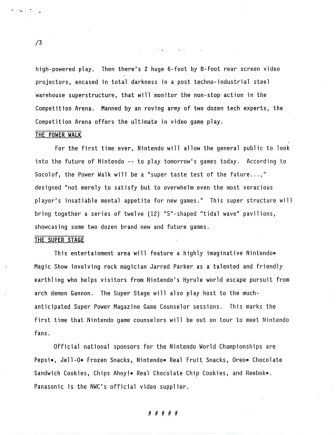 I believe it was my mother who discovered an article in the newspaper advertising the Nintendo World Championships happening in Milwaukee (about an hour drive away). I had not heard of them before that, and didn’t know what to expect. 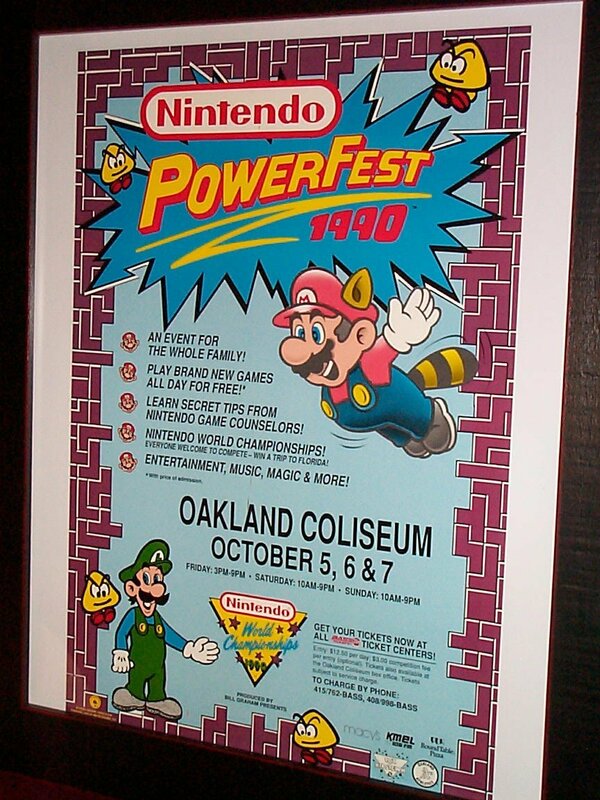 I have no recollections of the ad itself, but I do remember practicing up on some Super Mario Bros. and Rad Racer before heading to Milwaukee. That same year, I had just switched schools, and I was having a bit of trouble finding a new friend to go along. I ended up taking an old friend of mine along, and we headed out on Saturday morning. As we pulled into a parking space, and were standing in the ticket line, my excitement level was growing by the minute. Walking into the HUGE room, the first thing we came across was the . 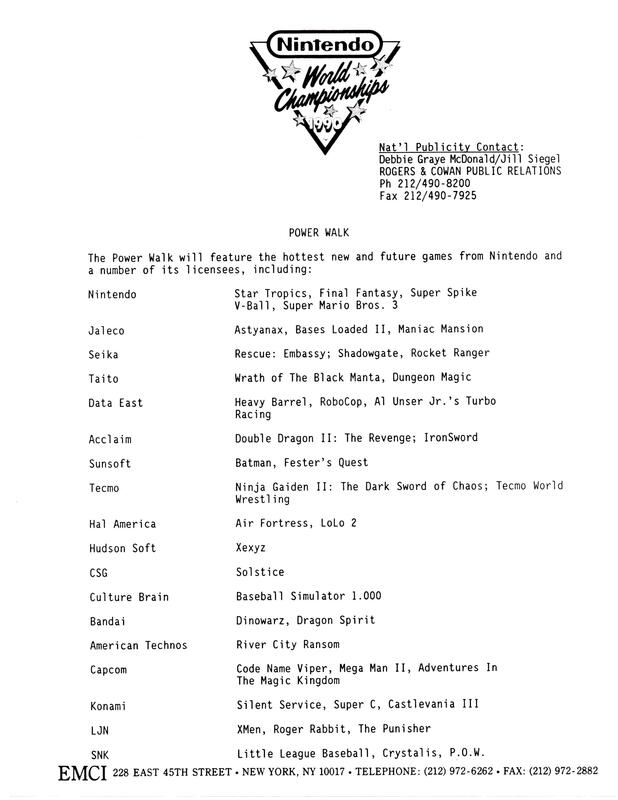 The Power Walk featured dozens of games set up that were either brand new, or not even released yet. It was very similar to the gaming stations commonly found in stores today, but back then, there was nothing like it in stores to let you test new games. I recall Mega Man 3 being a big highlight, with one of the longest lines. These games would automatically reset every few minutes, so the next person in line could get their turn to play. They had a similar set up with a Game Boy section, but they were not nearly as popular. They had a large stage set up on the far end of the room, with shows happening every so often. 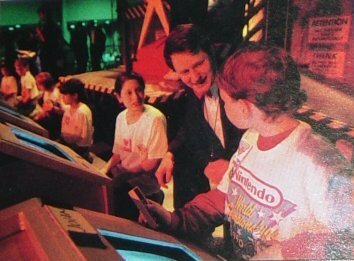 One of the shows featured Nintendo game counselors giving away tips that could help out in the competition, and a question/answer segment where the audience could try to stump the pros. A different show displayed some up and coming games, and gave the audience a chance to win prizes with various Nintendo trivia. My friend and I went to try the competition. As everyone probably knows, you have a time limit of 6 minutes, 21 seconds. 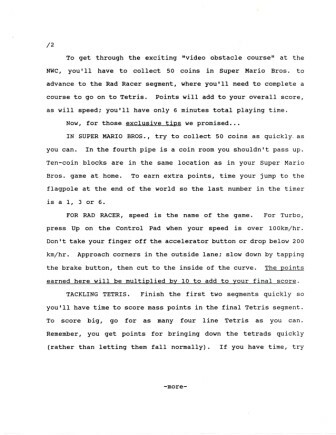 You start by collecting 50 coins in Super Mari Bros., then you move on to Rad Racer and finish the first race in the game. Finally, you get as many points as possible starting at Level 0 in Tetris. 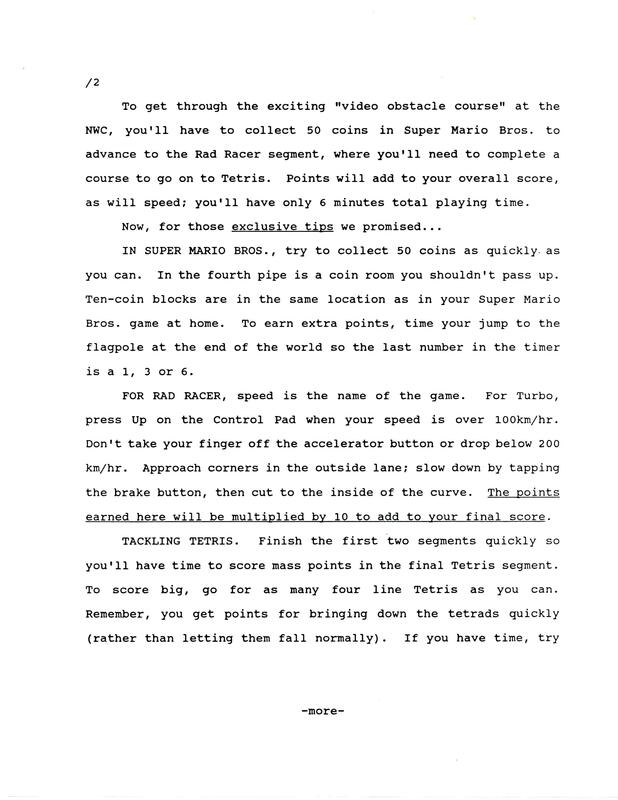 One last thing to add… your Super Mario Bros. score is multiplied by 1, your Rad Racer score is multiplied by 10, and your Tetris score is multiplied by 25. Obviously, in order to do well, you have to be a Tetris whiz. When you went into the competition area, there were hundreds of competition stations lined up in rows. 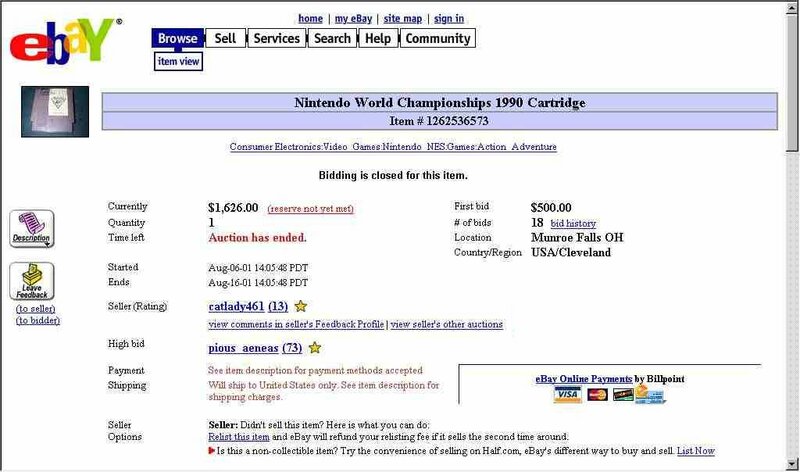 There was a small fee to compete, and I’m guessing it was necessary to keep people from competing over and over just for the heck of it. 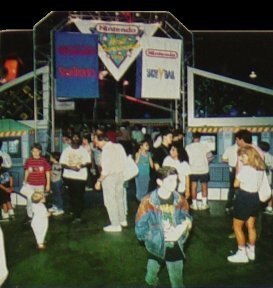 When you competed in this pre-stage area, you had to finish with a score of at least 150,000 points to move onto the stage. I was able to qualify with a score of about 175,000. My friend didn’t fair as well, and was done. For the next round, they let you up on the stage, where they had a total of seven gaming stations set up. Six were up in front, and then there was the throne, which was an actual chair to sit in, and it was in the back of the stage. 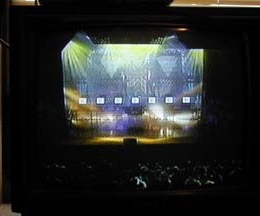 Each station had a TV display on the front, so the audience could see what was going on with all of the competitors. In addition, they had two huge video screens displaying two competitors at a time. I’m sure I was nervous a bit at the time, playing in front of an audience like that, but when I concentrated on the game, I was fine. To qualify past this round, you needed 200,000 points. I was rapidly improving, and after this round, I qualified again with over 400,000 points. The whole time while playing, the emcee of the show was doing commentary. 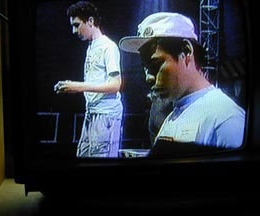 He was walking around on the stage, and changing the two big screens every so often, to show different players. 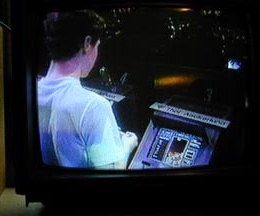 I was on the far-end console, and unfortunately, he never had my game screen shown on the big screen, even though I was the highest scoring player of that group of 7. 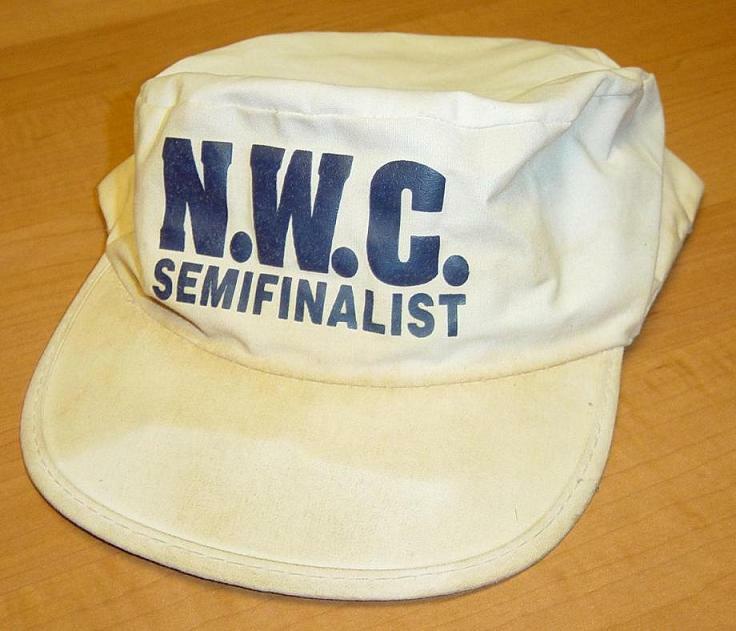 After qualifying to the next round, I was handed an NWC Semifinalist Cap (I’ve seen Semifinalist shirts in some pictures, but Milwaukee wasn’t that lucky I guess! ), and I received a pass for competing in the semi-finals. 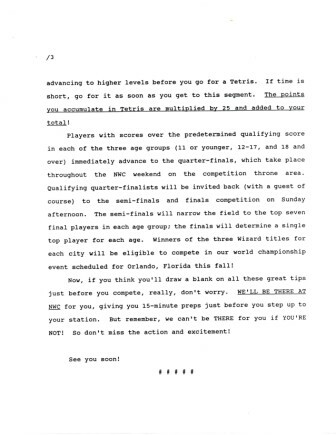 I noticed right away on the pass that the semi-finals took place the next day, so I was a bit disappointed, but overjoyed once my parents said I could come back. After competing, my friend and I were free to check out everything else. There were costumed characters that came out every once in a while, who we greeted. 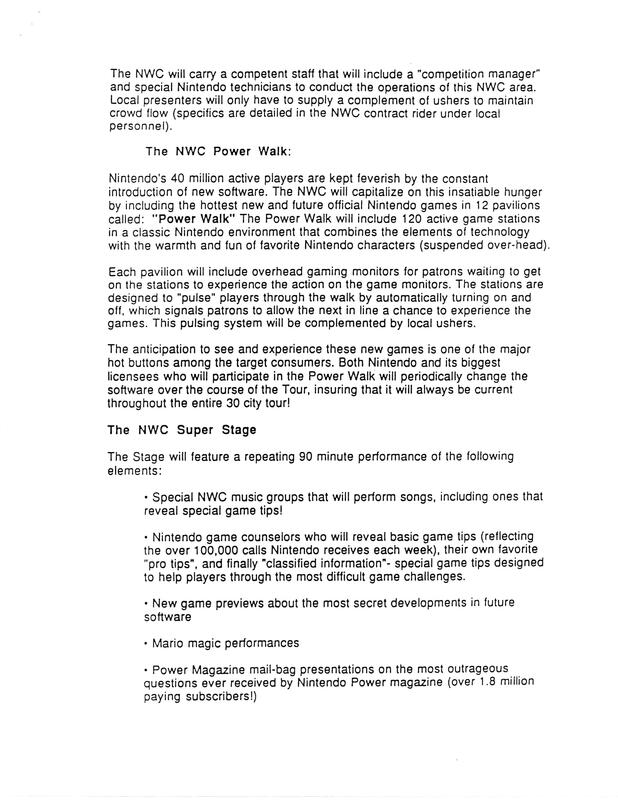 There was a big set up for the NES Power Pad, sponsored by Nike. The Power Pad had its own area, where you walked up some stairs, played World Class Track Meet, and then went down the stairs on the other side–not very busy (I think they were expecting a large line). 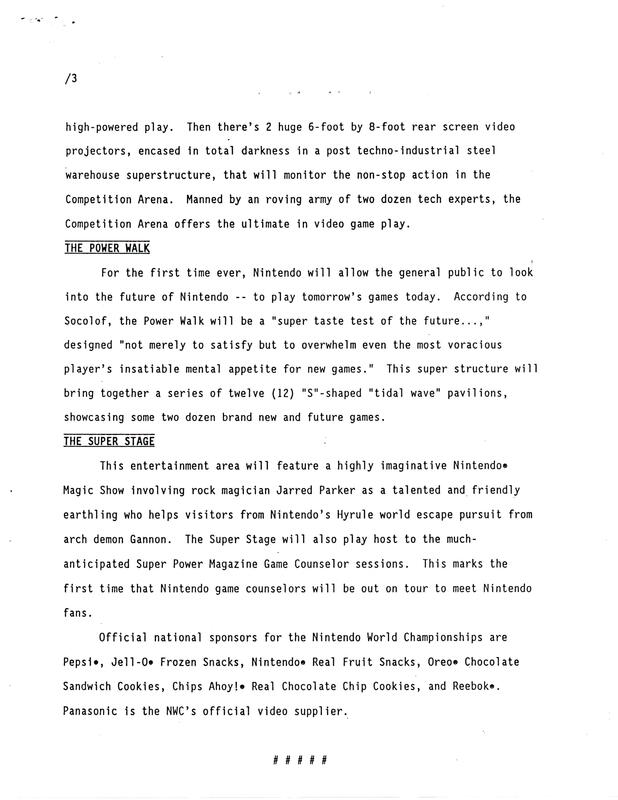 I believe there was some sort of fruit snacks that were sponsoring the Mario Rap–you pay a fee, make a rap video with Mario, and then they give you some fruit snacks. I can’t say that anyone made the video that weekend. 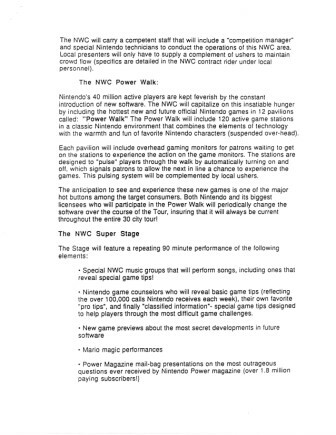 My friend and I tried out various games in the Power Walk area, but never stood in line for the very popular ones (didn’t want to wait in line that long). I know I tried out some Solstice, an RPG with first person view (Swords & Serpents), and many others. We went to the stage area and sat in for a couple of the shows. In the show where they were doing Nintendo trivia, I won a prize and my friend won a prize (two separate shows). For my prize, they flashed a screen shot of a game for 1 second that you had to identify. Then, they had the cameraman pick someone in the audience to answer. Somehow, he made eye contact with me, and then turned his camera around to face me. The emcee came over, and I answered Mega Man 2, and won a shirt. For my friend’s prize, they did the same sort of question. They flashed a shot of Willow on the screen, but absolutely nobody in the audience was raising their hand (I didn’t know it, either). The emcee had to give a hint “it rhymes with pillow” and then I told my friend the answer, who raised his hand, and the emcee came over. He won a pin with Mario on it. Later on, my friend gave it another go with trying to qualify, but unfortunately, he did a little worse the second time (he lost a life in Super Mario Bros., which hurt him). I remember seeing one of the higher-scoring players on the big screen at one point. It was amazing how fast he was placing blocks. It was like the down arrow was held down constantly, with a little maneuvering left and right. The hardest part for me was starting on level 0. I was so used to playing Tetris starting on level 9, where I don’t bother too much with holding down to place blocks. That speedy player on the stage ended with a score well over 1,000,000, so my score of 400,000 was not looking too great anymore. The following day, my parents brought me back to the competition mid-day, close to the time when the semi-finals would begin. There was a huge line of semi-finalists. 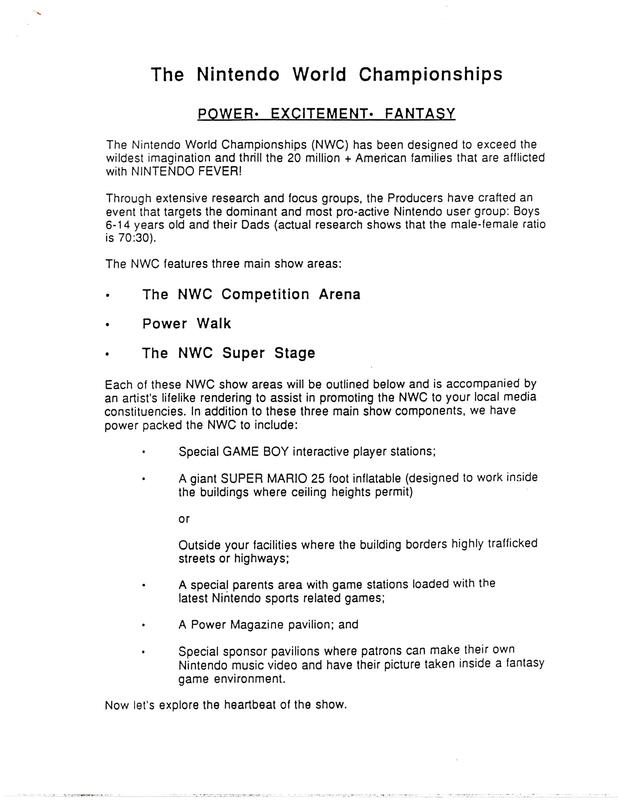 In fact, in the 12-17 age category, they could only let in half the people at a time, even with those hundreds of NES stations in the pre-stage area. The game started, and I was in the zone. I got through Super Mario Bros. very quickly, drove through Rad Racer in a very respectable amount of time, and then it was time for Tetris. I tried doing some quick maneuvering with the blocks like I had seen the day before, getting as many Tetrises as I possibly could. When the round ended, I waited for the final screen to pop up, and there was my score: 625,000! Everyone stayed at their machine, and one of the officials started calling out “If you scored more than 1,000,000 points or more, please raise your hand.” A few people raised their hands. Then they called out for people scoring 900,000, and then 800,000, and by that time, they had their seven people. Then, our group exited, and they let in the second half of the 12-17 age group of semi-finalists. In that group, they had some more people that scored over 1,000,000, so unfortunately, for the guys that scored 800,000 and 900,000 in our group, they were out of the top 7. I wasn’t in that top 7, but the thrill of watching the finals from the audience was still full of excitement. They started the finals with the adult age group, and then the under 12 age group. The scores were high, but not nearly as high as the 12-17 age group. I know they got Game Boys for prizes. Then it was time for the 12-17 guys to take the stage. It was incredible to watch the speed of these guys compete on Tetris. When the timer neared the 10-second mark, the audience started counting down along with it. They took the top two guys, and had them compete head to head to determine the final champion. 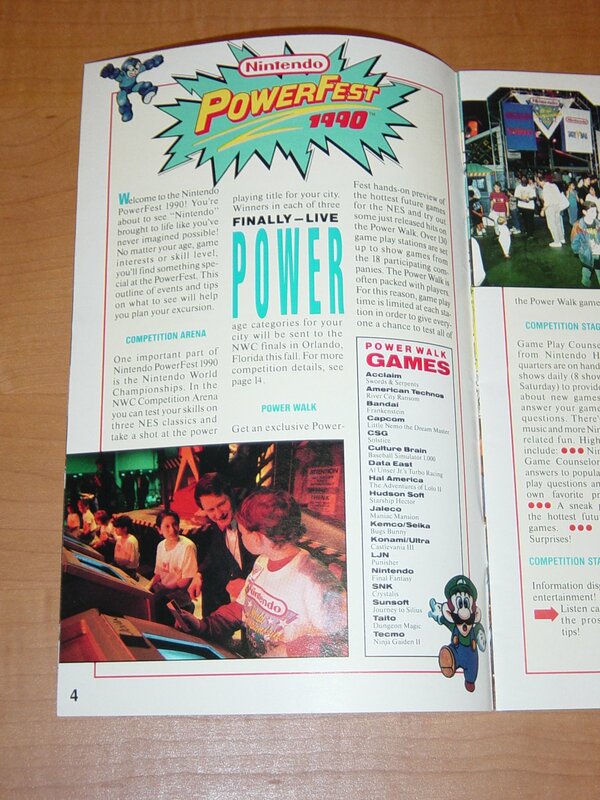 They got going, and throughout Super Mario Bros. and Rad Racer, they were neck and neck. Then came Tetris, and they were going for big points. Unfortunately for one of the two guys, he had waited for a long piece, but it just was not coming at all. His stack of blocks was nearing the top, and he realized that he had to get rid of some lines quick, because that long one was not coming. Unfortunately, the height of the blocks was too great, and his game came to an end. He had to start over on Tetris. Meanwhile, the other guy was raking in the points, and there was no hope of catching up to him. The audience did the count down again, and when he was done, his score was over 2,000,000! It was amazing to watch. As the place emptied and we were leaving, I had high hopes of another event the following year, but it never happened. 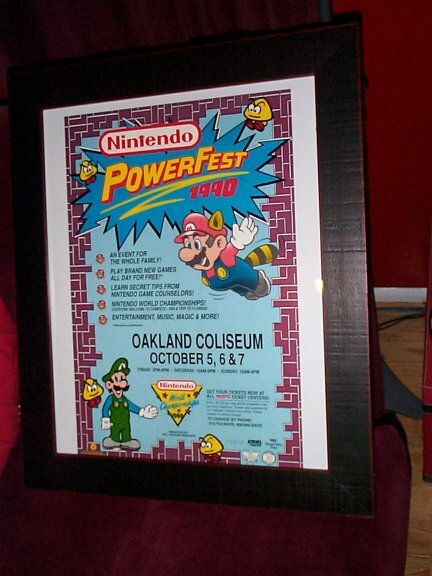 The above is a framed official Nintendo Powerfest/World Championships 1990 poster salvaged from the event floor. See a close-up photograph. 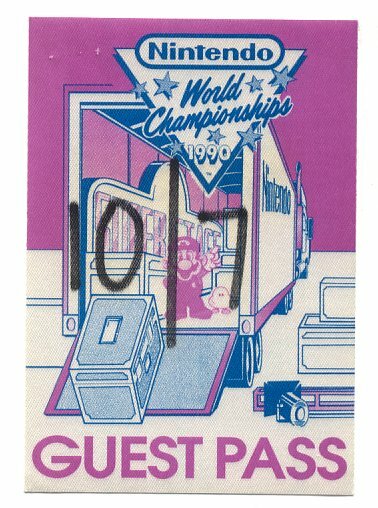 This is a genuine ticket from when the event was held from October 5-7 1990 in Oakland Coliseum in Oakland, California. Take note of the times: 10AM-9PM. Certificates with printed signatures of Nintendo Gamemaster Howard Phillips and “Mario” were given out to participants. This particular certificate would have been awarded to a quarter-finalist. 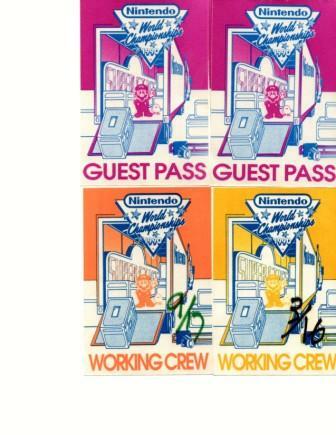 Also from the contest in Oakland Coliseum, this is a guest pass for a backstage look at every little gamer’s dream, the NWC. 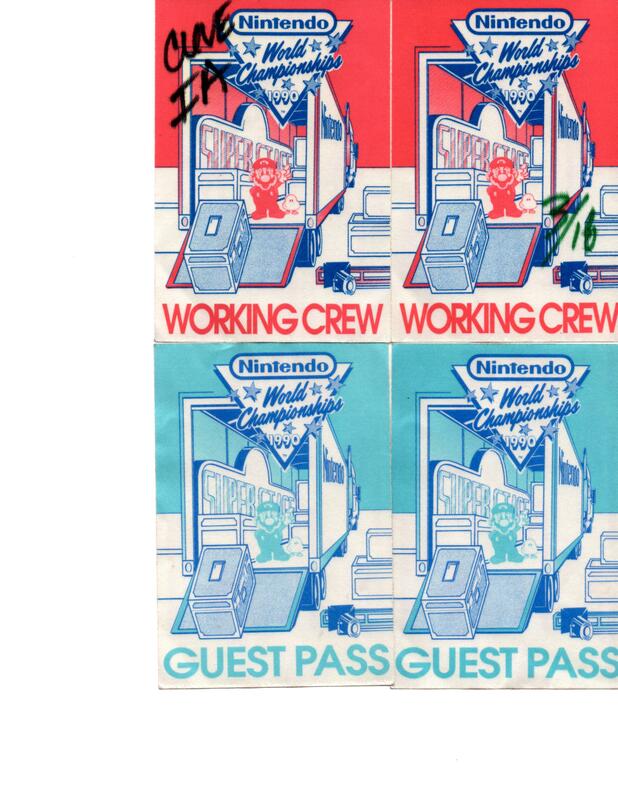 These are more guest passes as well as some working crew passes. 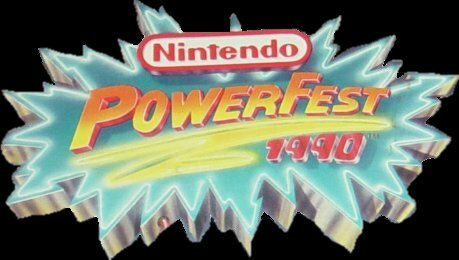 What most people don’t know about me is that I attended and was a competitor in the 1990 Powerfest held at Universal Studios in southern California. I decided to go after watching several local promotional ads and a show that showed what the place was like. It was video game heaven! Every new and upcoming game imaginable, every Nintendo character to shake hands with, and every memory to cherish for ages! I just had to go! I begged my parents, and on one October weekend, we did. We arrived at Universal Studios pretty early in the morning. In fact, before the opening, so we had to wait outside. A few minutes later, we obtained our tickets and went into the complex. Taking the normal tram ride as always through the place was the first order of business following our tradition. Yay for gunfights, going inside studios, and of course King Kong. After our ride, we searched for the warehouse of heaven. Pretty big place as expected. Hard to know the dimensions, but it seemed like 1/2 a football field to me as a kid. 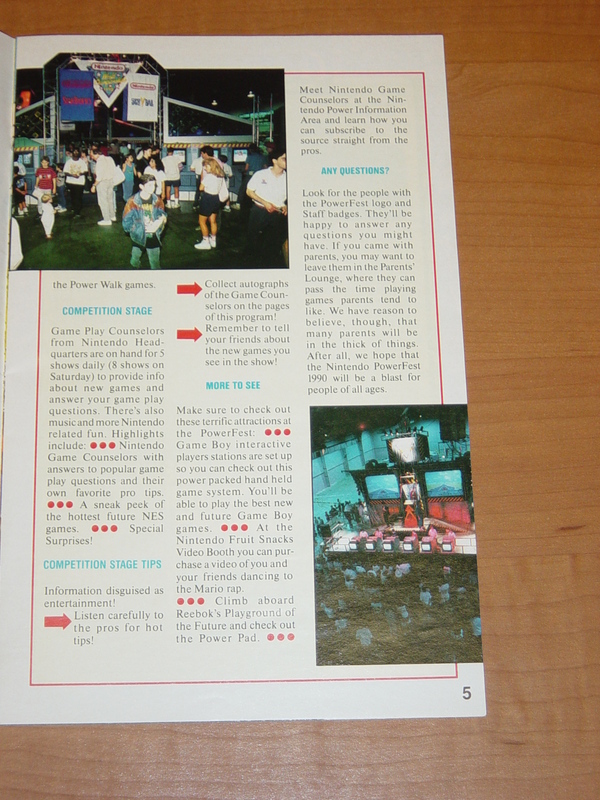 The first game that I played was World Class Track Meet. This was a modified game and the lady let me keep my shoes on. It was a 2-player game, but the second player was modified to become the computer. Pretty easy match, but the computer was a tad harder. Off to the next game! I walked by some familiar games like SMB2 and review counters like the “new” Gameboy and the upcoming next generation system that was going to blow away the Genesis (SNES to the unobvious), but the most reveling game met me at the warehouse: River City Ransom! The characters looked interesting, the plot was great, and best of all was being able to crack your enemies with lead pipes and bike chains! I continued playing this game till they shut off all the systems for their “45 minute reboot.” Oh well, we went off to the gaming center to start the competition. 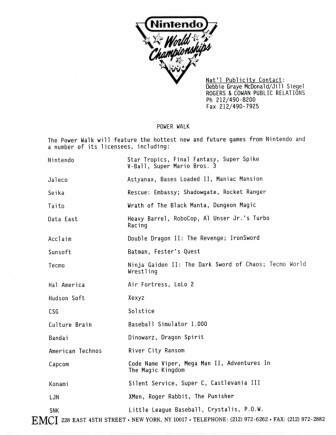 Mind you that I had no idea what the games were before playing, so I had to read the game cart as it was being displayed on the screen quickly. In Super Mario Bros., I just ran as fast as I could through the game, collecting coins at an alarming rate. I got the mushroom at the beginning to have that power-up. I went through the pipe before the 1-up spot and landed on all the coins and proceeded to complete the challenge. Time was ticking and I was losing patience because I hit the flag on 1-1 and had to wait crucial seconds for Mario to go in and out of the castle and into the pipe for 1-2. I spent very short time in 1-2, as I reached the 50 coins right there. Next game: finish Rad Racer’s first course. Pretty simple here. I’ve played this game enough times at the dentist’s office to have no problem with it. I did get knocked once on a sharp turn going at max speed, though. Final game: play Tetris till time expires. My dreaded nightmare! At this point, it was my first time ever playing this dreaded game. I was shocked and didn’t even know what to do. I was just placing lines everywhere and getting lucky by scoring a couple of lines before time expired. The final score? 195,500! I made it! I made it! I’m in the semi-finals tomorrow! The dude congratulated me and escorted me to my parents, explaining the process that would have to take place tomorrow: Meet coordinators, find your playing time, etc. I was ready to play in front of a crowd. 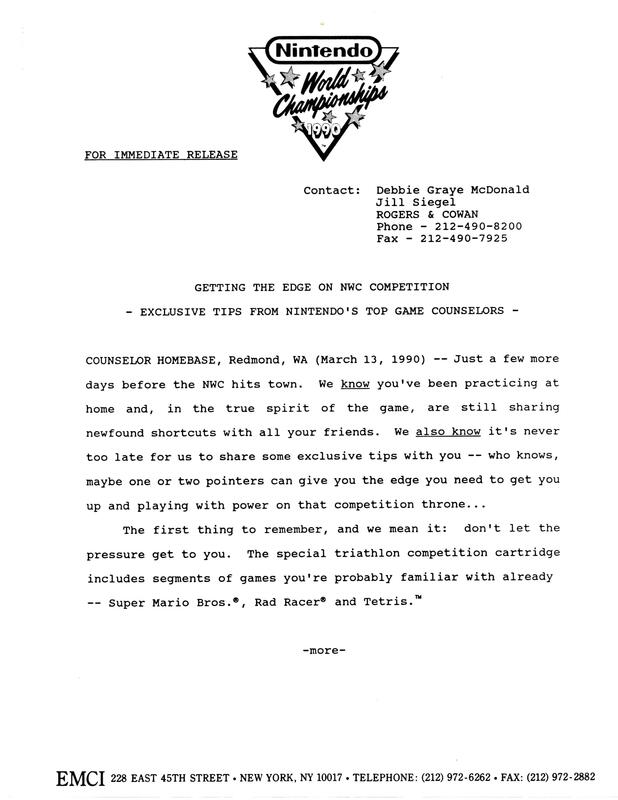 I was ready to conquer the game that everyone wanted to play… Super Mario Bros. 3! After the chat with the tournament official, I understood that I had to be there strictly at a certain time or I was disqualified from further competition. 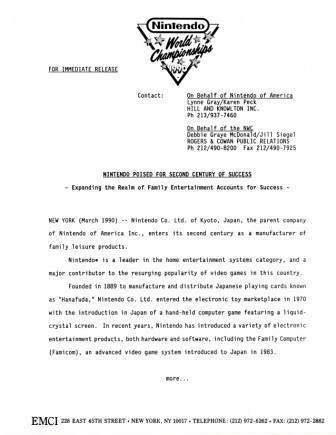 Also, I would be playing the newest NES game, Super Mario Bros. 3, and I couldn’t even practice, so I’d be playing the tournament with no experience in the game and would be rusty as I didn’t practice that morning. It was Sunday and we went back to Universal Studios, Hollywood for the semi-final showdown. I was obviously nervous when we signed up with the tournament director. My mouth and body was shivering, although it was a hot day. 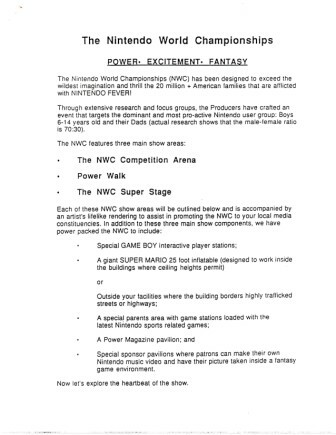 I was only two steps away from the NWC! I had to wait about two hours until my match and it felt like the longest two hours of my life. I was stressing it out by pacing back and forth. My mom had to force-feed me so that I could have proper nutrition. Well, two hours passed and the director found me with my parents and called me over to prompt some instructions. 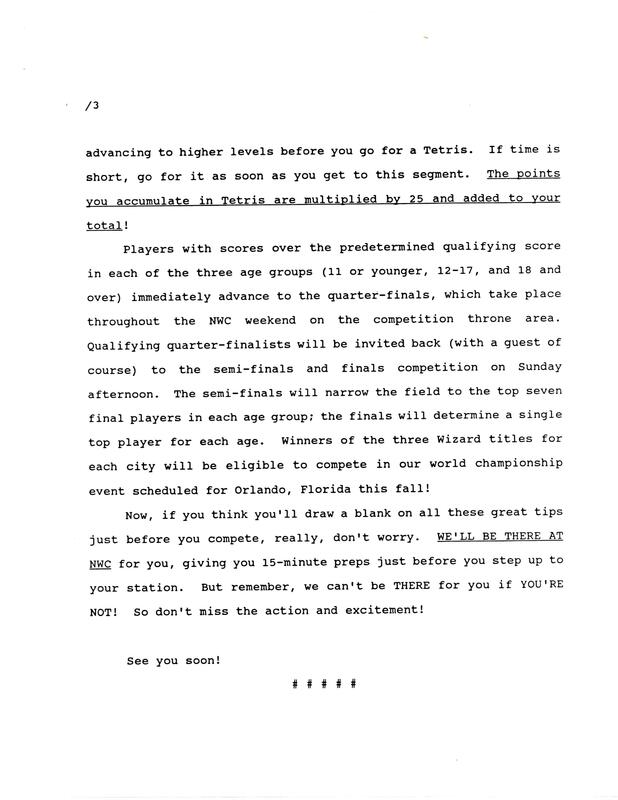 It was nothing much, just some rules about the competition. 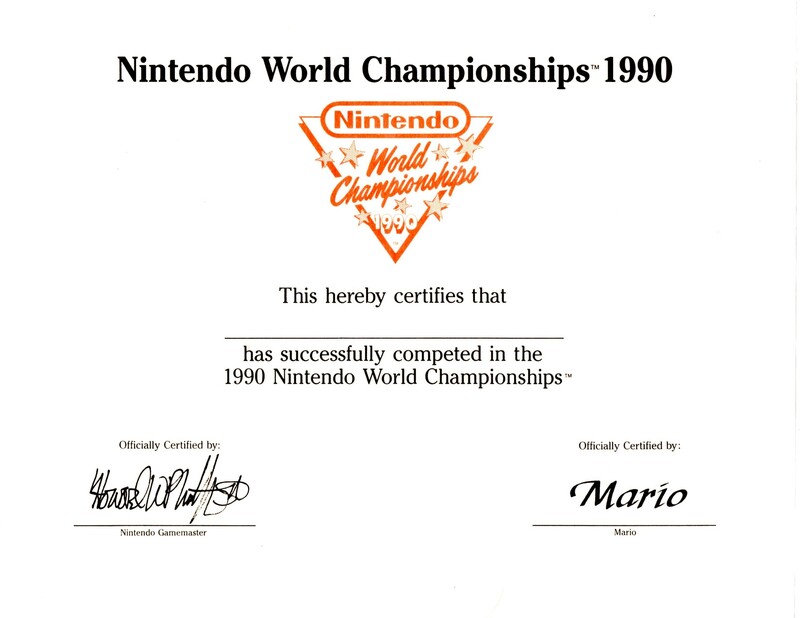 I had learned that I would have to score the most points in Super Mario Bros. 3 in 5 minutes out of a group of three opponents to continue in the tournament. It was pretty much the same exact instance from the movie The Wizard, so you know what I had to go through in order to win. They started us out at the World 1 screen so we had to waste 10 seconds getting into World 1-1. The beginning looked similar to Super Mario Bros., so I just walked moderately through the level. I knew I had to get the most points, so I bopped almost every Question Box that there was, getting credit for obtaining the coins and power-up items. Halfway through the level, I became Raccoon Mario and racked up some major points jumping on the green Koopa Troopas and Paratroopas that were there. I pretty much just ran the rest of the level and ended it. I was trying to concentrate as hard as I could, so I wasn’t looking at the time left or how far behind or ahead my opponents were at this time. I’m pretty sure I had used more than two minutes of the allotted time to complete 1-1. Now off to 1-2! About 10-15 second goes away using up the World screen. Bah, I hate that. Anyways, level 1-2, as you know, has massive scoring if you use Raccoon Mario to jump continuously and hit the Goombas over and over again. Of course, I didn’t know that, as it was my first time, but I did get some points off that method. The time was winding down, so I didn’t want to waste it in one area for so long. I did go into the pipe where the P-Switch was located and reaped the coins from below, so that was good. Yet, the Warp takes you back a few feet, which was the bad part about it. Anyways, there wasn’t anything else interesting about this level other than getting the Starman and running through the rest of the level and finishing it. Now, I had a choice with the less than 60 seconds left on the timer. I could either go to level 1-3, level 1-4, or go to the first fortress. Using the knowledge that I have now, I probably would’ve went to level 1-3 because I could run through the level since it was short and score the timer bonus, but I went into the fortress probably thinking I was going to get through all of World 1. Silly me, that wasn’t the smartest thing to do. I entered the level and instantly got smacked by a Podoboo since I was panicking and had to run through the level. I instantly regained Super Mario with the mushroom nearby, but there had to be less than 30 seconds remaining. I just became suicidal and ran, thinking that this was my only chance to do anything for the win. I got the second power-up and reached the door, saw the spikes, and the screen froze, ending the match. I breathed out a large sigh of relief and just stretched by arms back awaiting the result. It took them about less than a minute to write down the scores and verify them, but I wasn’t announced as the winner. Boo-hoo, I should’ve done my practicing. We all left to an applause and my parents did the normal “You did a good job” blah blah blah bit. I was sort of in tears, but I wasn’t that bad in shambles. 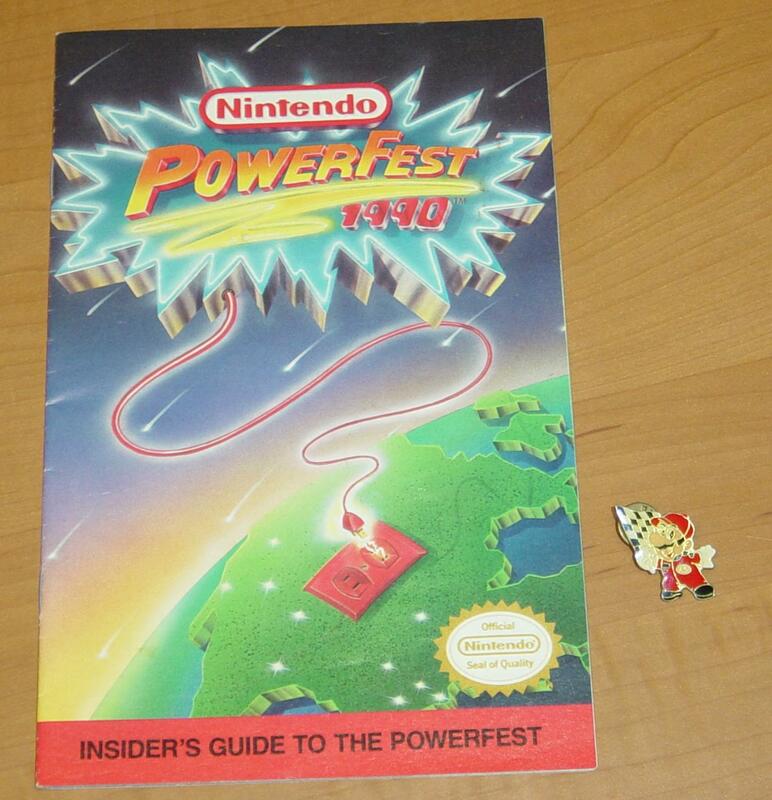 I did become one of the top 10% of NES players in the US presumably by reaching this far in the Powerfest. Thus, the journey to the NWC was over and my hand at one of those cartridges was lost. 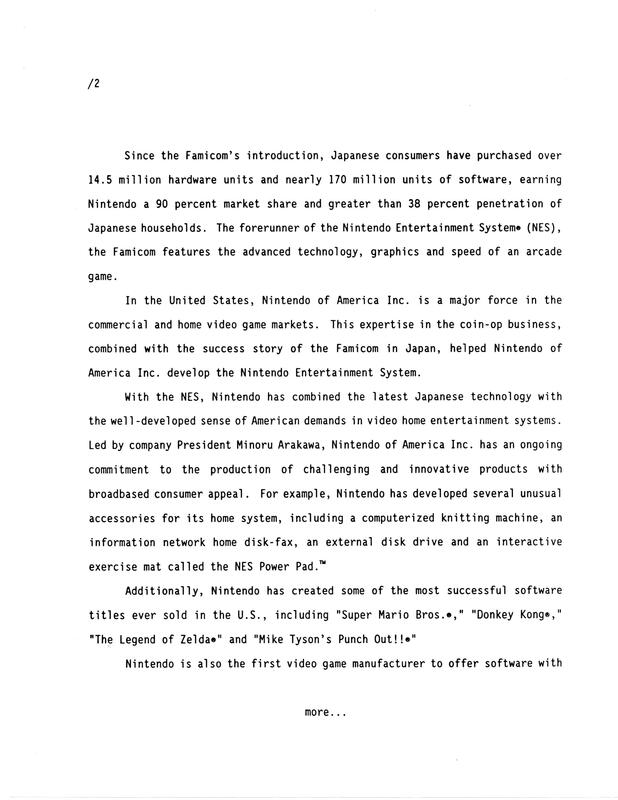 The epilogue of this story is that my dad purchased River City Ransom and Super Mario Bros. 3 and I beat the former in 6 days and the latter in 2 weeks (by warping), but I’ll always remember the weekend I had. 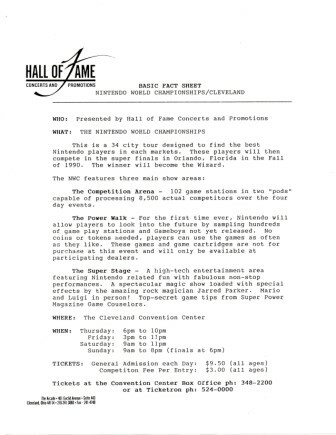 Although some of us remember that there were more tournaments such as the local Captron ones (which I did participate in one for F-Zero), the Blockbuster SNES/Genesis, the Starfox tournament, and the 1994 Powerfest (which I didn’t go to because they weren’t playing anywhere locally to my knowledge), the first ever national tournament that started it all was the best. 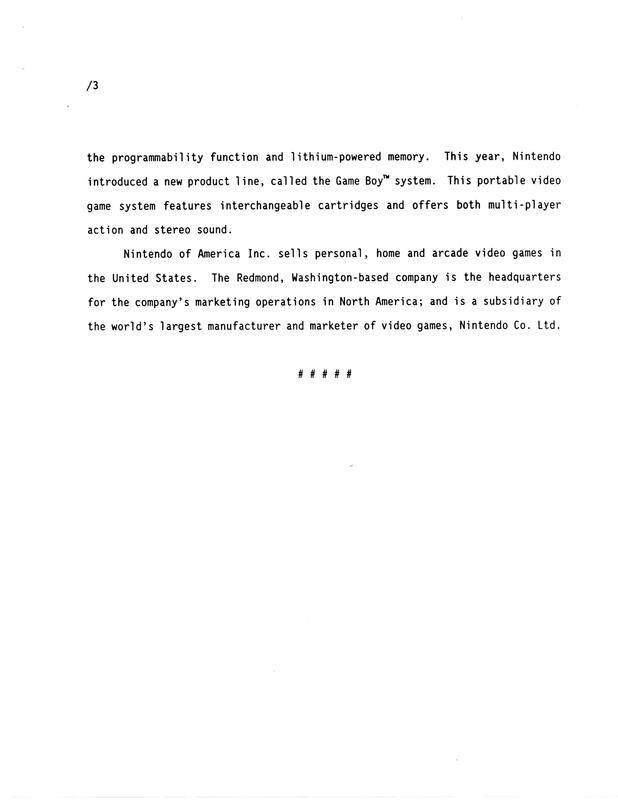 These days, I rarely get to play any NES games as it is, but I will always remember the day that I played Super Mario Bros. 3 for the first time in that special way. 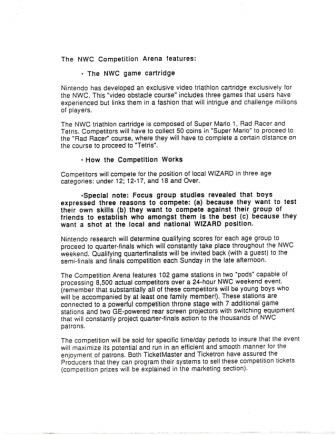 More and more NWC cartridges have been coming to light because of the prices they command these days from deep-pocketed collectors wishing to relive that fateful competition. Nintendo World Championships Semi-Finalist Cap* – Note the sweat stains, the trademark of a true player.